​​Capoeira was originally developed by African slaves during the colonial era in Brazil, and is one of the fastest growing sports worldwide. In 2014 it was recognised by UNESCO as "intangible cultural heritage". We teach in school during curriculum time as an alternative to traditional school sports, with the aim of developing students’ physical literacy. We can work off-timetable in special workshops and after-school clubs, which can build towards one-off student performances for annual celebrations or carnival, and also deliver day-long CPD for teachers wishing to integrate elements of Brazilian dance, music or culture into their regular in-class teachings. We work to a ratio of 20 children to one tutor. We prefer to teach in half- or full-days, working with multiple classes, for example, an afternoon of workshops consisting of 4x30 minute classes and an after-school club of one hour; a whole day of workshops, consisting of 4x1 hour workshops. 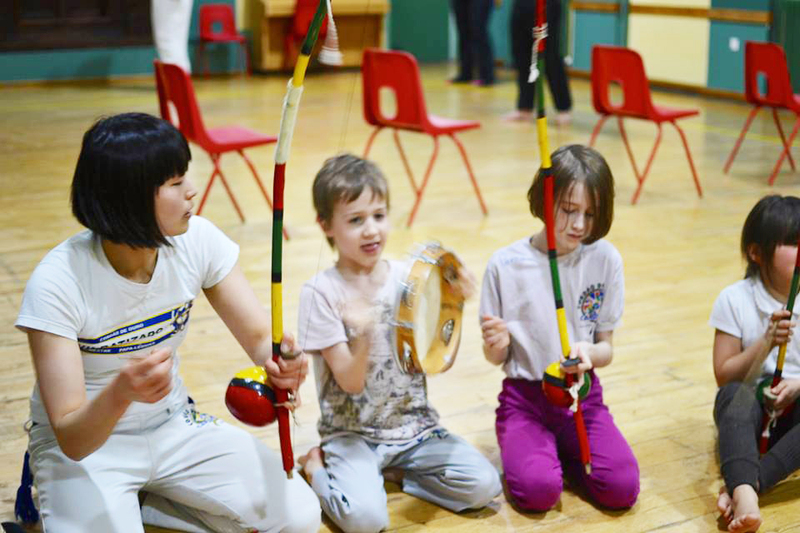 CPD for teachers comprise a day of learning the approaches to teaching the form of Capoeira, appropriate to the emotional and physical stage of your students. Fill in our contact form below for further information on our rates and services, and to hear about our availability.